When the skin pores become blocked due to dirt and dead cells, it leads to blackish spots on the skin known as blackheads. It is a common skin problem troubling the young as well as old. Hardening of oil in the pores on contact with air causes a formation of dark black spots. Too much oil in the skin due to oily food, beauty products, and menopause worsens the problem of blackheads. Hormonal problems and changes also trigger this skin issue. It can occur on the skin of nose, chin, and forehead. Turmeric is a natural ingredient with antiseptic properties that helps in healing the skin. It is useful for fighting blackheads. Turmeric fights skin infections and helps in getting a beautiful and flawless skin. We will explain the ways to remove blackheads with turmeric. 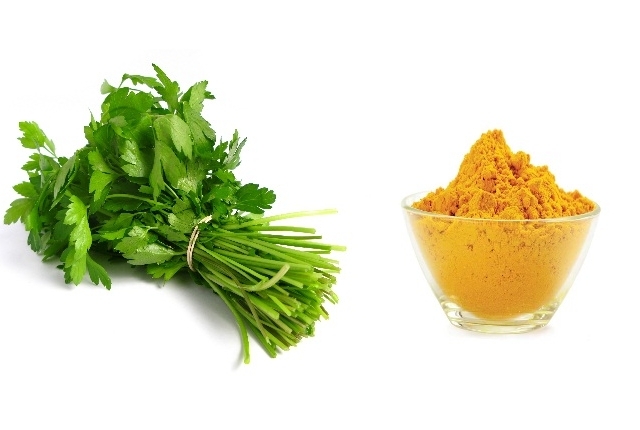 Extract juice from coriander leaves by grinding it in a food processor. Mix turmeric powder with it. Apply the mixture on the face before sleeping at night. Wash the face after thirty minutes using lukewarm water. Take one fourth teaspoon turmeric powder. Add a double amount of sandalwood powder to it. Mix two tablespoons of curd with it and make a smooth paste. Apply the mixture on affected skin areas. Wash the skin after half an hour using lukewarm water. Wash the face again with cold water. Make the skin dry. Apply moisturizer. Blackheads can be removed from the face by using turmeric and rice powder. To use this remedy, mix half a teaspoon of turmeric powder with an equal amount of honey. Mix double amount of rice flour or powder. To this, add a double amount of lemon juice. Mix all the ingredients well. Apply the paste on the face. Do a gentle scrubbing on the skin. Wash the skin using normal tap water. Turmeric powder is effective for removing blackheads when used with cinnamon powder. For this, take an equal amount of turmeric powder and lemon juice. Mix the two things well. To this, add an equal amount of cinnamon powder. Apply the paste over the blackheads on the face before sleeping at night. Leave the mask on the skin overnight. Wash the face when you wake up next morning. Use the mask for a few weeks to heal the problem of blackheads. Extract juice from mint leaves by crushing or grinding it. Mix turmeric powder with it. Apply the mixture on blackhead affected areas of the face. Wash the skin using lukewarm water after twenty minutes. Turmeric used with gram flour helps in removing blackheads and clearing blemishes on the skin. For this, take two tablespoons gram flour and add half amount of yogurt with it. To this, add half a teaspoon turmeric powder. Mix well. Add one teaspoon honey to it. Apply the mixture on the face. Leave it and wash the skin after twenty minutes using lukewarm water. The gram flour helps in scrubbing the skin and getting rid of blackheads. Turmeric has anti-inflammatory properties and it removes blackheads when used with coconut oil. For this remedy, make a paste by mixing very little coconut oil and turmeric powder. Apply the mixture on the blackhead affected areas of the face. Wash the face after ten minutes using lukewarm water. Mix a very little amount of water to sandalwood powder to get a paste. Add an equal amount of milk and turmeric powder to it. Apply the paste on the face for ten minutes. After that, wash the face with tap water followed by lukewarm water.